New in May 1949, with the comparitively rare highbridge version of the post-war ECW body, this bus was delivered to London Transport in common with many other Tilling Group vehicles from around the counry, to help out with the acute vehicle shortage in London, and saw service from the long closed Putney Bridge garage (code F) on route 93, Putney - Epsom. It made its way to its rightful owner Eastern Counties a year later. As well as their well known territory of Norfolk and Suffolk, Eastern Counties operated into south Lincolnshire, with outstations at Crowland, Market Deeping and Spalding. 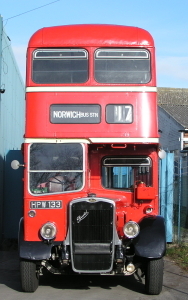 As fleet number LKH 133 (the K and H representing Bristol K type, Highbridge) it operated from various garages including Peterborough (Jan 1952 - Sep 1954), Kings Lynn (June 1958 - July 1965) and Norwich (Oct 1965 - Oct 1969.) After being de-licensed in October 1969, it was sold in March 1970 via dealer Ben Jordan to Brookside Coaches, Market Deeping. It was purchased for preservation in 1973. Work finally got underway in 1977. Restoration was complete in 1980 and it was regularly rallied until 1997, when a further restoration commenced - the platform being rebuilt, the lower deck re-panelled, the rear wheel arches renewed, and the bus repainted. Various electrical and mechanical parts were renewed or overhauled during this period. The body is aluminium framed, with hardwood inserts so that the panels can be pinned and screwed to the main framework. The platform area is totally of hardwood construction which sits on the rear chassis extension. The second restoration was completed in 2004, 'HPW' returning to 'service' at our November Open Day. A number of original Eastern Counties interior adverts have been retained or added. July 2006 - We have exchanged three blinds with the Ipswich Transport Museum so they can have authentic Ipswich Depot blinds to suit a bus in their fleet - HPW now has an authentic set of Norwich Depot blinds, being allocated to that city in its career. July 2007 - Remedial work to stop an internal water leak on the engine. Oct 2007 - Now tested and attending several rallies, including Showbus, Meadowhall, Norwich and Ruddington as well as attending the Lincolnshire Steam & Vintage Rally. This bus has had a charging fault which is being investigated. April 2008 - The chassis is being re-silvered. October 2008 - 'HPW' was out to the East Coast Rally in June which concluded at Bridlington. It also attended the Lincolnshire Steam Rally near Lincoln in August. July 2011 - Investigation work is on going to sort a water leak in the front block of the engine. January 2013 - The rear axle oil seal has been renewed.